What is the difference between a “hazardous location” and an “area subject to human impact load”? Click here to view a pdf on how codes define where impact safety glazing is required. IBC model codes stipulate that all fire-rated glazing must comply with the same impact safety requirements that apply to any other type of architectural glazing. Prior to the 2003 and 2006 IBC, model codes exempted traditional wired glass from having to meet the same impact safety requirements as any other glazing. Loss of that exemption was a big step forward to minimizing serious injuries. The 2003 IBC removed the exemption for wired glass in educational occupancies, and the 2006 IBC removed the exemption for all occupancies, so that wired glass is now required to meet the CPSC safety glazing requirements, just like any other glazing product. In addition, the IBC 2003 and 2006 IBC prescribe a higher requirement for glazing used in gymnasiums and similar types of athletic facilities, requiring glazing used in “areas subject to human impact load ‘ to meet the Category II CPSC impact standard. The terms “hazardous location” and “area subject to human impact load” are used in the code requirements for safety glazing. 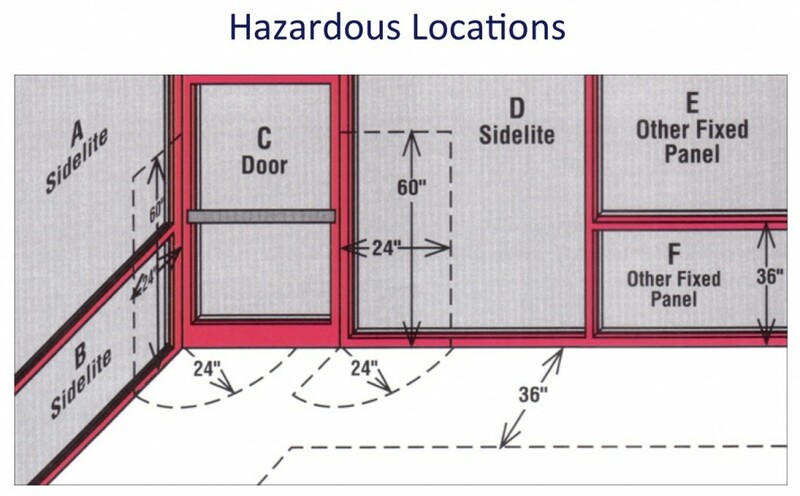 Hazardous locations are areas specifically defined in the safety glazing chapter of the building code, in section 2406. As examples, hazardous locations include vision panels in doors, sidelites adjacent to doors, and large fixed panels near walking surfaces. The term, area subject to human impact load, is broader than the code definition of a hazardous location and is relevant when glazing is used in an athletic facility. These are a few examples where safety glazing is required. Please refer to Chapter 24 of your local IBC model code for a complete listing of requirements and exceptions. Note that in an athletic facility, Fixed Panels E and F would have to be glazed with Category II safety glazing. One significant difference is when the glazing is used as an other fixed panel. 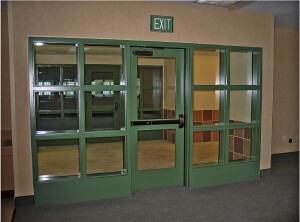 The code defines other fixed panels as areas requiring safety glazing when four conditions are met: the glazing panel is larger than 9 square feet, AND the lower edge is within 18 inches of the floor, AND the top edge is more than 36 inches from the floor, AND the panel is within 36 inches of a walking surface. Even if all these conditions are met, the code does not require safety glazing if a 1-1/2 foot horizontal bar is installed within 34-38inches of the floor. But, if one of these four conditions is missing, or a horizontal bar is installed, are these areas subject to human impact load? Almost certainly, yes. The term “subject to human impact load” is specifically found in the safety glazing requirements applicable to glazing used in gyms, athletic facilities, multipurpose rooms used as gyms, and similar types of facilities. Under section 2408.1 of the IBC, the code requires glazing in areas subject to human impact load to meet the highest CPSC Category II safety glazing standard, regardless of the size of the panel, or whether the area is technically defined as a hazardous location under section 2406.1. What this means for glazing in athletic facilities is that designers should specify Category II safety glazing in fixed panel areas where the code would not otherwise require safety glazing. 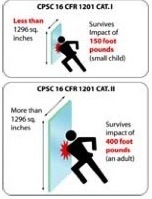 Glazing used in doors and sidelites has to meet CPSC impact safety requirements. To meet the fire and safety requirements of this application, SuperLite I is used in the 20 minute door and SuperLite II-XL 45 is used in the 45 minute sidelites. Both SuperLite I and SuperLite II-XL 45 meet CPSC Cat. II, the maximum safety standard.